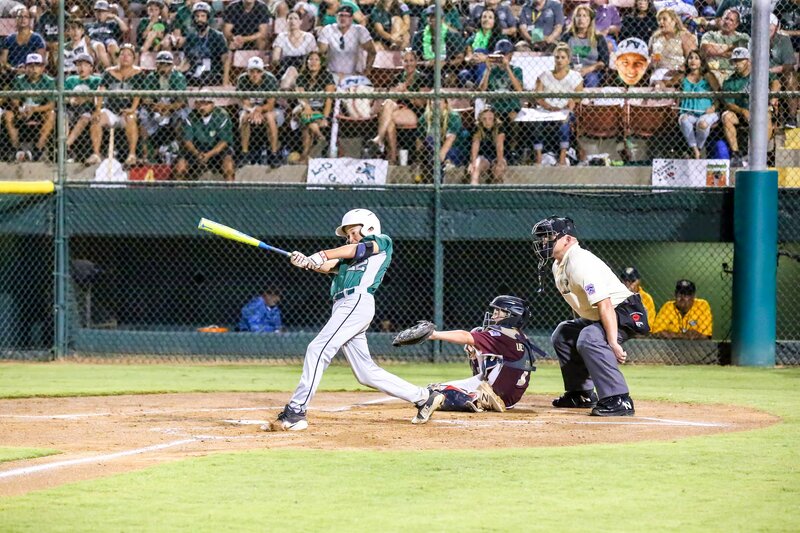 The all-star team from Chula Vista’s Park View Little League‘s hopes of reaching the World Series for the third time since 2009 ended Wednesday evening with a 7-5 loss to its counterparts from the Tri City Little League in the West Regional. Park View was unable to overcome a 4-0 first-inning deficit at Al Houghton Stadium in San Bernardino. It cut the deficit to 7-5 with one out in the bottom of the fourth inning when Jose Mendoza walked with the bases loaded with one out, forcing in Anthony Leyva, who singled. Benjamin Tipper retired the next two batters to end the inning, and retired the side in order in the fifth. Tipper induced Leyva, the leadoff hitter in the sixth and final inning, to fly out to left. Reliever Tanner Dykstra retired the final two batters, striking out Ivan Rodriguez Jr. to end the game. Park View was limited to five hits. Three of the hits were in the bottom of the first when it scored three runs, cutting the deficit to 4-3. Leyva led off with a double and scored on Rodriguez’s double. Connor Alonzo singled in Rodriguez and Mendoza, who walked. Rodriguez singled with two outs in the bottom of the second, moved to second when Mendoza walked, but Tipper struck out Joseph Anderson to end the inning. Tri City combined three singles, a double, a walk and an error for its four runs in the top of the first. Tri City added a run in second. Nathan Erickson singled to right with one out, moved to third on right fielder Kenneth Skinner’s error and scored one out later on Tyler Allen’s single. Park View cut Tri City’s lead to 5-4 in the bottom of the second. Leyva walked with one out, moved to second on catcher Aiden Weissenberg-Frost’s passed ball, moved to third on Tipper’s wild pitch and scored on another wild pitch three pitches later. Tipper tripled in Troy Estes, who singled, in the top of the third. Tri City increased its lead to 7-4 in the fourth when Allen doubled in Erickson, who had been hit by a pitch. Tipper, the second of three pitchers from the Rocklin-based Northern California champions, was credited with the victory, striking out seven, walking four, hitting a batter, throwing two wild pitches and allowing two runs and two hits in 4 2/3 innings. Dykstra was credited with the save. Park View starter Matthew Bjornstad was charged with the loss, allowing five runs, three earned, and five hits, walking one and striking out three in 1 1/3 innings. The game was a rematch of Park View’s 16-8 victory Sunday in the opening game for both teams in the regional. The loss was Park View’s second in the modified double-elimination tournament. It lost 5-3 Monday to the all-star team from Las Vegas’ Silverado West Little League, the Nevada state champion. Park View, the Southern California champion, was 13-2 over four tournaments. Park View won the 2009 Little League World Series. It won the 2016 West Regional to qualify for the World Series, where it lost two of three games.